Tokyo is making one of its boldest interventions yet in Japanese aviation by orchestrating a tripartite cooperation that will involve rivals All Nippon Airways and Japan Airlines codesharing with Skymark. Japan's third largest carrier, Skymark was earlier this year forced to withdraw from an over-optimistic plan to take six A380s. That left Skymark with an enormous penalty on top of the larger than expected start-up costs for its A330s. Tokyo aims to ease Skymark's current deficit by having the ANA and JAL codeshares boost Skymark's revenue. The codeshares as envisioned will not directly address Skymark's daily costs or the A380 penalty. Skymark, a once highly effective LCC in the Japanese market, has long derided what it saw as the legacy airline environment exemplified by ANA and JAL. Japan's two incumbent behemoths also did not think much of Skymark, which they saw as something of a distraction. So the fact that Tokyo is orchestrating Skymark's rivals effectively to help the airline shows the weak position Skymark is in. The codeshare also reflects Tokyo does not want to be blamed for a possible collapse of Skymark and overall deregulation policy shortcomings. Some think Skymark in recent years has been aggressive bordering on the reckless with fast growth and too many aircraft projects. Skymark, which had only a few dozen narrowbody 737s, attempted to take two different widebody aircraft types within a year, the A330 and A380. Skymark repeatedly delayed its A330 launch due to preparation work, increasing start-up costs. Some think Tokyo should have exercised more oversight. In Aug-2014 there were talks between Skymark and ANA about a partnership; that also included the possibility of taking Skymark's A380s. This and the current codeshare talks are similar to the "umbrella" situation Airbus recommended in Jul-2014 when negotiations were continuing with Skymark over the order. Skymark has confirmed Airbus has started preparing a lawsuit against it in Britain, but Skymark notes this is a "preliminary step in the preparation of a lawsuit and does not mean it has developed to an official lawsuit". Skymark says it is "still negotiating with Airbus for the solution of the problem" regarding the A380. News of the lawsuit - although no surprise - caused Skymark's stock to fall, undoing the gains made earlier in Dec-2014 on news of a possible partnership. The message from the government is apparently that ANA and JAL cannot be permitted to operate a duopoly in the domestic market and there is no other serious contender: the other "new entrants" like Solaseed and StarFlyer have limited prospects while LCCs cannot fill the void. Some of the LCCs anyway are more interested in Japan's international market than in domestic routes where JAL and ANA dominate. But were Tokyo Haneda slots to be made available, this view could rapidly change. In Nov-2014 it came to light that JAL and Skymark could partner, a scenario neither the government nor ANA felt comfortable with. They consider that the previous Japanese government allowed JAL an unfair advantage by restructuring. Partnering with Skymark could give JAL a further boost it should not be entitled to, the argument goes. Japanese regulator the MLIT is calling for Skymark to partner only with ANA or both ANA and JAL. Skymark president Shinichi Nishikubo did not respond well, saying MLIT's suggestion “defied common sense" and was "divorced from the logic of private-sector enterprise." ANA also did not initially respond well, telling Nikkei in Nov-2014: "It is impossible to think about cooperation with JAL". But Skymark has come around and ANA is now being diplomatic. ANA president and CEO Osamu Shinobe told CAPA at the recent Star Alliance CEB meeting in Delhi that: "The purpose of this whole codeshare is to revitalise Skymark. So whether we want to do it [alone without JAL] or don't want to, rather than that we are discussing what type of scheme will be helpful for Skymark. We need to make some decisions down the road." Mr Nishikubo wants to see Skymark through in the medium term but in the long term wants his airline to be independent, and so is worried ANA may demand a stake in Skymark in exchange for cooperation – as it has with StarFlyer. ANA sits on a large cash pile, part of which had been earmarked for use in acquiring Southeast Asian airlines to give ANA access to higher-growth markets, but this plan has been postponed. While using this cash to further its position in the domestic market would be contradictory, ANA has already done so by increasing its stake in StarFlyer, although this was for a relatively small sum. Mr Shinobe is focusing on a codeshare and not an equity stake or closer cooperation – or at least not yet. "We are looking to start a codeshare and I was not informed of any other discussion topics as of today" Mr Shinobe said. ANA and JAL will need to accommodate how to make a codeshare work on Skymark's A330s, which essentially have premium economy cabins compared to ANA and JAL's cramped interiors. ANA has some experience with its codeshare on StarFlyer, which has a more premium position but not to the extent of Skymark's A330s. Skymark is under-achieving on yield performance. Its 2QFY2014 (the three months to 30-Sep-2014) yield was 33% lower than JAL. Skymark's yield was 41% higher than Jetstar Japan, but Jetstar Japan's yield data as reported to MLIT excludes ancillary revenue. Were this to be included, there would be a smaller gap between Skymark's yield and that of LCCs. Skymark's lower yield is despite operating out of convenient Tokyo Haneda airport. On some routes Skymark's A330s operate in all premium economy configuration, giving passengers far more space and comfort than ANA or JAL's cramped economy offering. StarFlyer, which has successfully marketed itself as a premium carrier, attains domestic yields slightly under ANA and JAL despite being significantly smaller than Skymark. Holding down Skymark's yields are various factors. ANA and JAL have an international network, online and virtual, as well as a range of partners, making their offering more attractive to those accumulating loyalty points. Skymark had been working on a loyalty programme but had to place it on hold as the A380 planning consumed management. Skymark has also not been strong in the corporate travel arena. Skymark does have a lower frequency and overall smaller size, but it should be able to attract some clients. Skymark has also had difficulty marketing itself: as LCCs entered Japan, Skymark made bold but ultimately alienating statements meant to convey it was low-cost (one such example was Skymark saying it would not necessarily respond to customer complaints). This contrasts to Skymark's premium A330 product, including free in-flight wi-fi. As Skymark has found, it does not have the cost base to compete with newer LCCs, and as such is exiting competitive routes from Tokyo Narita, where the LCCs operate (they do not serve Tokyo Haneda). The impact from a prospective ANA and JAL codeshare is unclear. ANA and JAL could sell Skymark capacity higher than what Skymark can, but Skymark may not necessarily share that premium. The dire nature of the situation suggests ANA and JAL have the upper hand in negotiating rates. Under the proposed cooperation, ANA and JAL will codeshare on Skymark routes, all from Tokyo Haneda. When the codeshare discussion was limited to JAL, the destinations were Fukuoka, Okinawa and Sapporo. When an ANA partnership started discussions, Kagoshima and Kobe were added, giving a total of five markets. These are Skymark's only destinations from Tokyo Haneda. One guiding concept is that Tokyo Haneda is slot constrained and carriers cannot add more flights. Therefore, codesharing on Skymark's services – and theoretically boosting Skymark's load factor – brings efficiency to unused seats and is in the interests of the public. Conversely, the over-capacity on Skymark's Haneda routes may give pause to ANA and JAL. A codeshare would be unlikely to see capacity rationalisation. There could be a stronger commercial rationale for partnering on thinner routes, and ANA in particular may push for this. In comparison, JAL is smaller than ANA in the domestic market so may be more content with boosting its presence on trunk routes. JAL may also not be able to codeshare as extensively due to its previous restructuring. Collectively the five proposed codeshare routes account for 46% of Skymark's capacity in Oct-2014. They are some of Skymark's largest routes, but not exclusively: Kobe-Sapporo and Kobe-Nagasaki are larger than some of Skymark's Haneda routes. 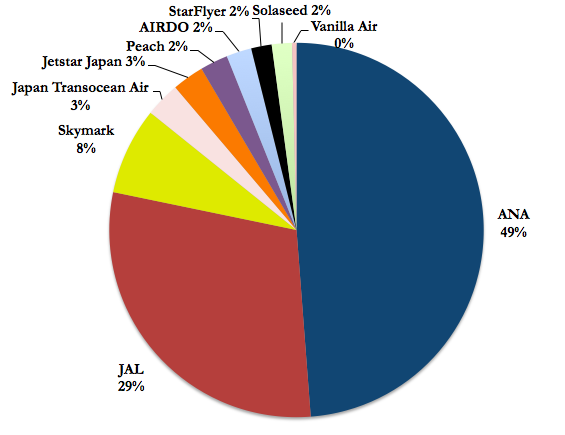 Skymark has about an 8% share of domestic slots at Haneda. On two routes from Haneda (Kagoshima and Okinawa) only ANA, JAL and Skymark fly. To Kobe, only ANA and Skymark fly. Fukuoka sees all three fly plus StarFlyer while Sapporo sees all three fly plus Air Do. However, the competitive dynamic on Fukuoka and Sapporo is lessened as ANA codeshares with StarFlyer and Air Do. Skymark in Oct-2014 sees about a 10-16% marketshare on the routes, except Kobe where it has a 61% share. 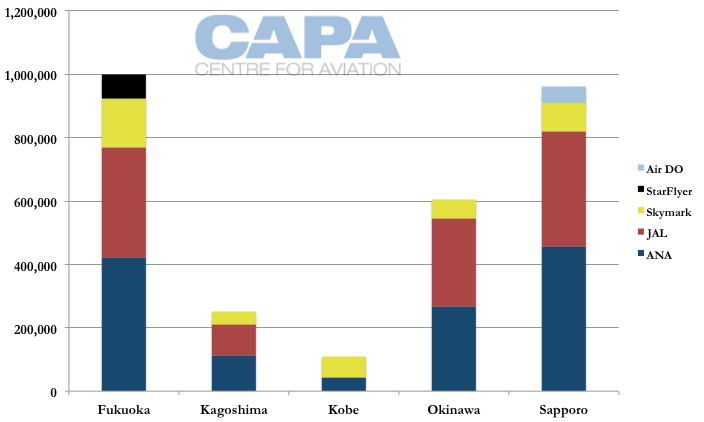 However, Kobe is the smallest of the five codeshare destinations. Some statistics have compared each carrier's frequency on the proposed codeshare routes. However, this is not necessarily the best indicator of market share as ANA and JAL mostly use high-density widebody aircraft while Skymark uses 737s, except to Fukuoka where it uses medium-density A330s. Regulations limit the share of seats that can be sold as codeshares on trunk routes. As such, a fraction of Skymark's capacity being sold to ANA and JAL poses little risk to market disruption. Provided MLIT does not revise its stance, and indications are that it will not, Skymark will still need to sell the majority of its capacity. Further, ANA and JAL will keep each other in check; the two do not compete with Skymark on price. Skymark has seen large load factor decreases on all its Tokyo Haneda routes for the period of FY2010 compared to the first eight months of FY2014 (latest data available). Sapporo declined 5ppt, Kagoshima 10ppt, Kobe 12ppt, Okinawa 13ppt and Fukuoka 18ppt. During this same period, Skymark's overall load factor declined by 11ppt, indicating the Tokyo Haneda routes have typically decreased faster than the average. Skymark's declining load factors are largely a result of growing capacity far ahead of demand. For example, comparing 8MFY2014 to 8MFY2010, Skymark has doubled its Haneda-Okinawa capacity while ANA has grown approximately 5%. 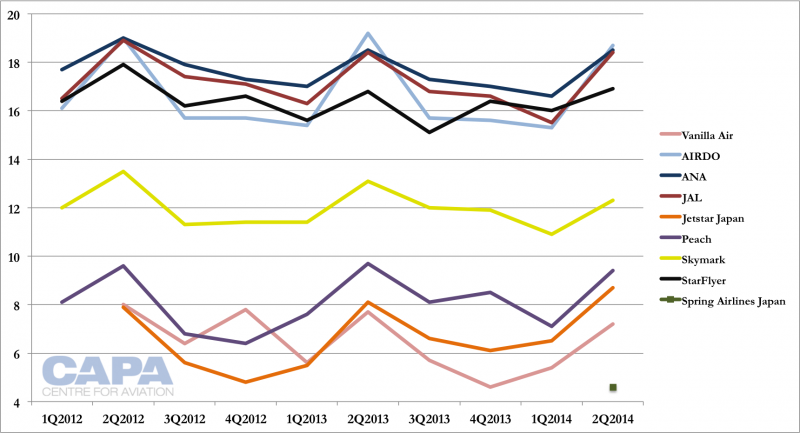 Skymark's growth is off a lower base, but even then its growth is still large. On the Haneda-Okinawa route Skymark has added approximately 175,000 seats and ANA only 50,000. 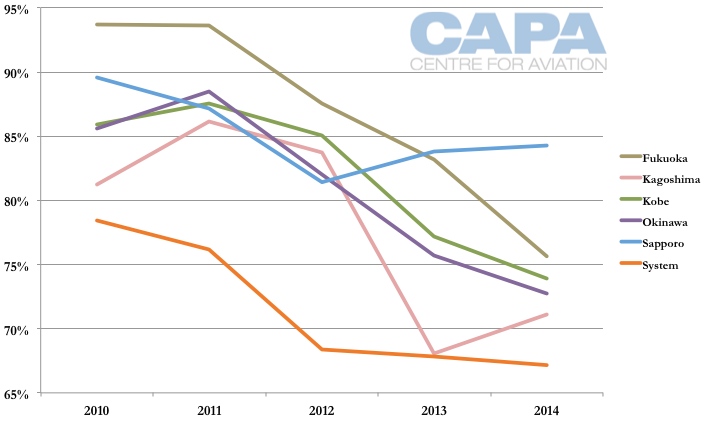 Skymark's challenge is that passenger growth rates are well below capacity growth rates. Further, Skymark's growth from Haneda has been much smaller than its average growth, indicating weakness on other parts of it network. These will not be covered (and helped) by the codeshare. This may also show Skymark's middle-market position has limited reach outside Tokyo Haneda, where capacity is constrained and any major route should be profitable. On Skymark's other routes, where it does not have the benefit of a closed market, consumers may not be resonating with its positioning. 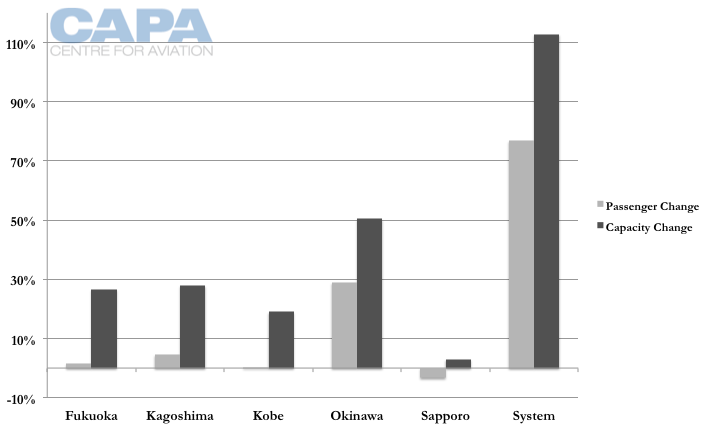 Skymark needs to be more efficient than ANA and JAL, and this includes having higher load factors to bring down costs. Skymark a few years ago had been doing that when it had load factors above 80% or even 90% while ANA and JAL hovered in the 60-70% range. But now Skymark has lost that efficiency edge. Only on three of its Haneda routes does it have a higher load factor than ANA and JAL in Oct-2014. But these three include the two small destinations of Kagoshima and Kobe. 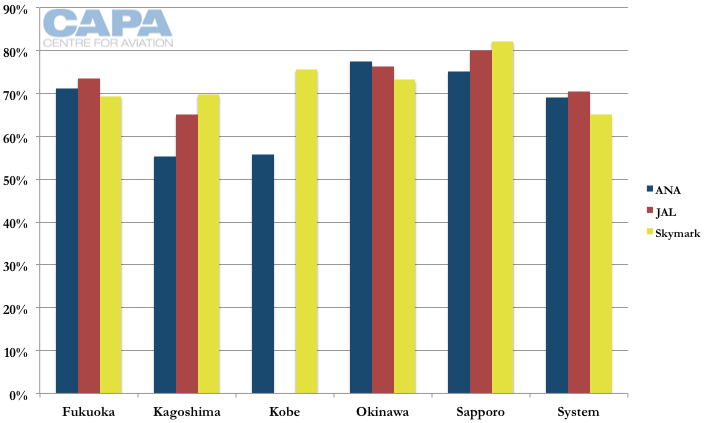 Skymark has a higher load factor than ANA and JAL to Sapporo, but not by a wide margin. Across the domestic system, Skymark has a lower load factor than ANA and JAL. Japan has been down this road before, calling on the behemoths to ensure smaller carriers remain afloat, but not to this scale. Regulations limit the number of seats that can be sold as domestic codeshares, varying if the route is trunk or not. StarFlyer and Air Do have been taken under the wing of ANA. In 1HFY2014, StarFlyer sold JPY4737 million (USD46.0 million) worth of seats to ANA. This equates to 27.6% of StarFlyer's seats. At Air Do, ANA accounts for one-third of sales. These are small numbers to ANA but large to the airlines in question. The ANA and JAL codeshares on Skymark should contribute additional revenue, and not change the booking pattern of existing Skymark customers, but by just how much is uncertain. Local reports have put the codeshare value around JPY8 billion (USD68 million) while Skymark president Shinichi Nishikubo said the JAL codeshare would contribute a higher sum at JPY8 billion (USD68 million) to JPY9 billion (75 million) per annum. Including ANA, the codeshare revenue could double. Gaining extra revenue from codeshares will help towards paying down the A380 cancellation fee, but more needs to be done. Skymark had JPY30.4 billion (USD369 million) in reserve cash on 31-Mar-2012 but by 30-Sep-2014 had only JPY4.5 billion (USD41 million). Skymark's aggressive expansion, unprofitable Tokyo Narita base and payments for work related to the A330s and A380s dwindled cash. Skymark expects to report a second consecutive annual loss for the year to 31-Mar-2015. Mr Nishikubo told the Nikkei that he was in talks with four foreign and domestic investment funds on the possible sale of a stake of up to 25%, which could raise up to JPY6000 million (USD49.8 million). Mr Nishikubo himself has capital he could inject, but is likely wary to do so. It is highly unlikely Japan will allow a foreign airline to invest in Skymark. Indeed, the ANA and JAL codeshares are partially orchestrated to ensure Skymark remains afloat - and without foreign airline ownership. Ultimately, foreign airline ownership of Skymark (at the requisite minority level) could be healthy for Japan as it forces Skymark and competitors to become lean. But this would likely be too far a leap for Japan. Despite its fragile present status there is an opportunity for Skymark to come out ahead in this arrangement. There is even risk to ANA and JAL that once the codeshare arrangement ends, the passengers they put on Skymark may elect to stay. To see that, Skymark needs improvements – corporate deals, loyalty programme, partners and maybe even alliance membership – to boost its appeal. Some of these initiatives were underway before the A380 became too much of a distraction. Private capital could help Skymark re-orient itself. Then again, with MLIT pushing the agenda it may not be too long before the regulator no longer supports Mr Nishikubo. His exit would also pave the way for rejuvenation. But first a number of attitudes and personalities, which have previously not meshed at all, must align. Once again the government is intervening to prevent yet another another airline in Japan going to the wall. These are highly contentious moves. But in the long term these arrangements could be in the public interest. If it can be nurtured through these difficult times, Skymark will still have the ability to innovate and create value, if it so chooses. There is a potential future value in Skymark that is far greater than its present position.